Shine, volume, and smoothness — all the girls are obsessed with reaching these characteristics when selecting devices and products for their hair. This time, I will tell you about hooded hair dryers. These devices help you reach the best results and get your locks silky and glossy right after drying. Hooded blow dryers are definitely worth your attention as they help create a perfect hairdo even without visiting a beauty salon. Whether you want to use a hooded hair dryer at home or at the salon, you’ve got to know the way it is handled, the types of hair it is suitable for, all the pros and cons of different models. So let’s dive headlong into the undiscovered universe of the best hooded hair dryers. There’s so much to learn! 1 What is a hooded hair dryer? 2 Why is the hooded hair dryer better than the others? What is a hooded hair dryer? Every hair dryer is meant to take moisture out of your locks. Some of them, extend this primary function and offer you a wide range of help with a hair modeling. 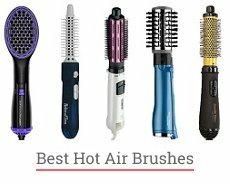 So that except for bringing the sense of freshness to your hair, these blow dryers and dryer brushes for styling make it look well-groomed and beautiful. Hooded hair dryers combine both of these features. And there are few other reasons you need to have this device at your disposal as soon as possible. I’ll start from afar as a hooded hair dryer has a long story. Actually, this type of dryers was one of the first in the history of the device. The hooded versions first appeared and quickly became widespread in US salons in the 1930s. They caused the real revolution in the professional hair treatment! Just imagine dozens of women sitting in a salon under the air-heating hoods, drinking coffee or tea, discussing all the latest news and gossips, having their hair dried and neatly styled. The hooded hair dryer became a symbol of an era and the most popular device for salon hair treatment for the following decades. First made of metal, later – of plastic, a salon hooded hair dryer migrated to the households to provide the salon care right at your home. 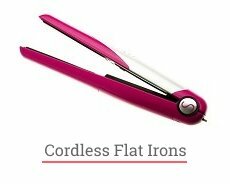 We still find this device in professional hair spa and salons and nowadays it is suitable for home use at an affordable price. Why is the hooded hair dryer better than the others? You may ask why a hooded hair dryer is better than a regular one? And I have particular reasons to claim this. Comparing to an ordinary, the hooded hair dryer provides a healthy drying. Instead of using hot air, it runs warm airwaves. Under direct heat, your hair is easily damaged. When warm air is used, it is protected. Of course, it takes longer to get your locks dried but the result is worth it. Hair integrity and shine will be preserved with the utter care of a hooded hair dryer. You can even improve your hair condition drying it with this smart device. Make a spa-procedure by applying nutrition cosmetics on your locks and placing it under the warming hood which will open the hair cuticle. Your hair will absorb the needed nutrients to get a better look right after drying. Get a healthy silky hair rather than a dehydrated chevelure with split ends. A hooded hair dryer relieves you of the need of doing an arm workout while drying your hair. You are literally hands-free to do anything. Manicure your nails, do makeup, flip the magazine pages, chat with friends — all that stuff you’ve always wanted to do while your hair is drying. Moreover, you can now use both of your hands to divide strands and to make a bit of hairstyling with your favorite product. The important thing about your hair: it doesn’t like to be touched while drying. The less manual contact you make, the better. Playing with your locks during the drying process leads to its freezing and tangling. When you do not touch your hair, you don’t cause mechanical damage to it. So I highly recommend you to put a head under the hood and get your hands on some sided activity. This rule doesn’t apply using brushes (wooden brushes as well), styling products, and so on. A hooded hair dryer is a perfect device for creating natural-looking curls and for drying curled hair as well. It seems like hair rollers and a hooded hair dryer were meant for each other. With your hair curlers on, you can easily place a head under a warming hood, apply some needed styler, and wait for some time to get your perfect curls. The girls who are curly by nature also prefer this device for drying. It doesn’t tangle the curls and makes them look beautiful and healthy. Last but not least: using a hooded hair dryer is an unusual practice that offers you a little time travel to the times when a self-care was not a part of a daily routine, but a special ritual. This sacramental moment when you stay alone with yourself and have a spare time for reflexion and real selfcare. When using a hooded hair dryer from 20 minutes for short haircuts to an hour for a long hair, you have an opportunity to relax, to meditate or even to take a little nap. Now you know why the hooded hair dryer is a trend again after so many years of oblivion. You can get a perfect air-dried look for your locks without causing it any damage. Moreover, you can even treat your hair while drying. Isn’t it a nice prospect? You can help your hair look it’s best using a hooded hair dryer at home or the hairdresser’s salon. Dry safely and profitably for your hair. And if you finally understood that your hair could no longer live without a hooded hair dryer, than it’s time to find a perfect one corresponding and satisfying all your beauty and care needs. If you weighed all the pros and cons and decided that a hooded blow dryer is a perfect match for your hair, then there is a solution. You can choose one of the best hooded hair dryers for home and use the device in the comfort of your own dwelling. Check our list of TOP-3 appliances for home use and make the first step to a healthy and beautiful hair. Don’t be confused with a word ‘Salon’ in the name of this ion hooded hair dryer. It was developed for home use and has an affordable non-salon price. Though, its strong part is the qualities considered to be professional. The usual price for Laila Ali Salon Ionic Dryer doesn’t exceed $50, that is why this hooded blow dryer becomes a worthwhile purchase for home use. Appealed by such an affordable cost, you will soon be captured by its colorful performance. Laila Dryer is designed in a purple and black color combination. A pretty device to put it in sight, I have to say. Laila is packed with features which are equal to a professional hooded hair dryer. Let’s see what benefits of a salon hair care you can get at home. First of all, it’s the ionic technology that lets your hair dry faster without causing damage to it. If you don’t need an ionic feature at the moment, you can simply turn it off. With 2 temperature and 2 speed settings available you can select the most comfortable regime for the type of your hair. There is also a cool air mode for finishing a perfect styling. Laila is powered by 1875 Watts which make it ideal for ethnic and curly hair. For those who want curls, there is enough space under the hood to sit under it wearing hair rollers. Moreover, it is suitable for traveling due to the portable design of the model. Nothing is perfect! And even Laila Ali LADR5603 has some features you may find undesirable. Laila may seem inconvenient for tall people as it needs a high pedestal to be placed to reach the head. As it is a table model, you can’t put it on the wall. Despite these small discomforts, Laila Ali LADR5603 is considered to be the best hooded hair dryer for African-American hair. It doesn’t cost an arm and a leg so that you can afford it even with a low budget on a blow dryer. the hood of the device is big enough for using hair rollers. If you look for a budgetary hair drying option for a trip, then Conair Pro Styler Bonnet Hair Dryer is as-good-as-it-gets. The price varies within $40. Conair Pro Styler Bonnet Hair Dryer weighs only 2 pounds, so it is perfect for transferring and taking on trips. The compact design is the best solution for those who prefer traveling with a small suitcase. Even if you have limited space at home, there will always be a place for this handy hooded dryer. The device is designed in a simple, minimalistic style and presented in white color. It also has 6-foot cord stores in the set. 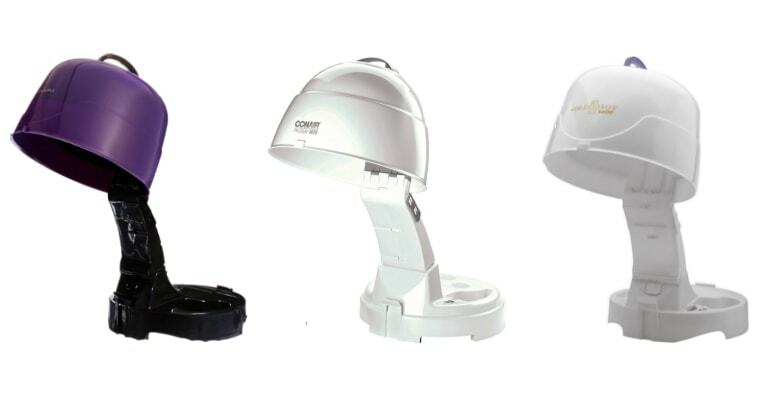 Conair Pro Styler Bonnet hair dryer is suitable both for drying and styling your hair. It will provide fast drying due to 1875 Watts of power. Thanks to its large and comfortable hood, you can wear hair rollers while using the device. With 2 temperature and 2-speed settings, you can adjust the needed airflow settings. Though some users complain about the uneven distribution of heat, I think this Conair hooded hair dryer can be a choice if you are not in search of a pricey variant for drying and styling. But I wouldn’t recommend it for owners of long hair as fast drying is not its strong part. To read about other Conair hair products, follow this link. portable design if you have limited space for storage. some users complain about the uneven distribution of heat. This Gold ‘N Hot hooded hair dryer is one of the most pricey of those for home use. But a bunch of professional features justifies the $60 cost. Gold ‘N Hot GH9271 Professional Portable hooded dryer offers you a complete professional drying and styling solution. The developer promises that the 1200-Watt blower with the variety of drying and styling options can guarantee you fabulous runway-ready hairstyles. Is it true? Let’s see. It is equipped with a fully-vented hood to provide the even airflow for perfect drying. It also offers to choose between 3 temperature and 3-speed regimes which significantly increase your opportunities for styling. The large-sized hood of Gold ‘N Hot fits even the massive hair rollers. The adjustable height is the needed option for finding a perfect position for drying. When some users complain about the loud motor of the device and the brittle plastic which is Gold ‘N Hot GH9271 made of, other already use it with pleasure. As for me, this Gold ‘N Hot hooded hair dryer is probably one of the best hooded hair dryers for home. But you must take into accounts its disadvantages before deciding on such a pricey purchase. adjustable height lets you find a perfect position for drying. some users report of a brittle plastic which device is made of. A professional hooded hair dryer is a perfect option for both beauty shops and for getting salon-equal hairdos at home. The choice of an appropriate device depends on a variety of services and the number of your salon clients. The bigger the salon, the more expensive blow dryers it can afford. When you have a customers queue, it makes sense to invest money in the powerful multifunctional devices. Of course, they are pricey enough. For salons at home, professional blow dryers with limited features could be sufficient. The main advantage of using hooded dryers at your home salon is an opportunity to serve multiple clients at once. That is a high-quality salon dryer of an Italian origin. Pibbs 514 Kwik Dri 1100W Salon Dryer has all the features that a professional hair dryer must have. First of all, Kwik Dri 1100W Salon Dryer is famous for the fast drying. Even the long locks will be entirely dried in less than an hour. It is perfect for styling as well and has strong popularity among curly-haired girls. With its flexible thermostat control, a warning light for exceeding the temperature regime, and a timer up to an hour you’ll have no chance to overdry your hair. Fast drying without damaging a hair – a perfect combination for a dryer. 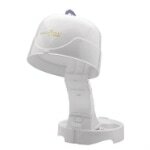 Moreover, it is convenient in use thanks to an adjustable stand of a full human’s height and a comfortable visor for directing airflows evenly on your hair. Everyone who has ever used Kwik Dri mentions its futuristic design and high quality of the construction. With five caster wheels, it is easy to move the device any time you need this. All these options and some extra features make Kwik Dri 1100W Salon Dryer a best-seller among the professional beauty devices. The only thing upsetting about this salon hair dryer which varies from $300 to $400. So if you are looking for the most profitable hooded hair dryer with stand, then you must look for something else. This one is a luxurious appliance for those who want to get the whole set of salon features and ready to pay a top dollar for that. flip top visor for even air distribution. The price of the device which varies from $300 to $400. 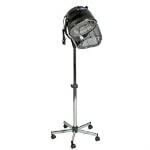 Salon Hair Dryer from Salon Sundry is a much more budgetary alternative for professional use. Though it costs not more than $100, it performs its functions bona fide. 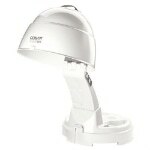 Salon Sundry Professional Bonnet Style Hood salon hair dryer is available in two colors: white and black. Thanks to the color alternative and minimalistic design it looks good in the salons of various interiors. This professional hooded hair dryer has a reliable, functional construction with the heating element made of stainless steel and a multi-blade fan. As the result, you’ll get fast and even dry. With in-built timer and adjustable temperature settings, you control the process of drying entirely. But there’s some inconvenience as the temperature control sets in Celsius, not Fahrenheit. 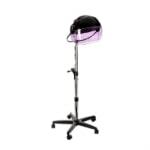 Salon Sundry Professional Bonnet Style Hood salon hair dryer has the adjustable pedestal with a spring letting set the height between 50 and 64 inches. At the same time, the device is rather heavy and occupies much space. If you need a practical solution for your salon, then here it is. 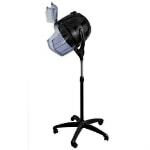 Salon Sundry Professional Bonnet Style Hood hair dryer provides a sufficient number of features at affordable price. This cheap hooded hair dryer rightfully won the hearts of many hairdressers and their clients. You can even buy it for home use but first, make sure that you have enough space for storing it. affordable price for any kind of salon or even home use. rather heavy and occupies much space. Looking for the golden mean between the pricey but super functional and low-budget but limited in features devices? This is Tourmaline Tools 1059 Portable Salon Dryer by Hot Tools. Its price starts at $130, and the range of functions increases significantly compared to the cheaper dryers. This ion hooded hair dryer has plenty of features which even more pricey devices don’t. It has a power of 1875 Watts that speeds up drying and facilitates styling. The developers promise up to 50% faster drying with maintaining your hair silky, shiny, softer, and less frizzy. Tourmaline Tools 1059 Portable Salon Dryer is equipped with the Pre-Moisture System which is a combination of tourmaline and ionic technologies for the perfect drying and styling results. With four heat settings and two speeds, you can select the most suitable regime for your hair. You can even use Tourmaline Tools dryer for spa-treatment procedures which guarantee you the perfect hair condition. This beauty device has an appealing design with a purple visor. It is movable and easy-to-dismantle. It greatly simplifies the process of moving and storing. If you are looking for the cons, then Tourmaline Tools 1059 Portable Salon Dryer is rather noisy. Some users report potential problems with the connection of the dryer’s head with its base. However, with such an achievement list of pros, Tourmaline Tools 1059 Portable Salon Dryer by Hot Tools becomes one of the most desirable purchases for a hairdresser’s salon. Drying, styling, and even curing a hair – that is more than enough from a professional device that doesn’t cost a fortune. The triumphal come-back of hooded hair dryers to salons and houses symbolizes the beginning of a new era. It’s an era of well-groomed, healthy, shiny, and soft hair. So if you have finally resolved to step into this beautiful-locks-age, you need to make your decision about the best device to choose. The high-quality hooded hair dryer can serve you for a decade, so you have to approach its selection with whole responsibility. To sum up our best hooded dryers review for home and salon use, I prepared some tips to simplify the process of picking. You need to determine what is the target audience of your future hooded blow dryer. Do you need it for family use or for serving dozens or hundreds of clients?It is evident that the more people are going to use the device, the more powerful it should be. It is normal to seat an hour under a warming hood when you are at home enjoying your favorite TV show and not hurrying up anywhere. The opposite situation can happen in a beauty salon. With a queue of clients in the shop, you need a powerful device for fast drying and styling and hence with a higher throughput. Think of the primary goal of the device you are going to purchase. Do you need it solely for drying? Then the most basic and affordable at price dryers can entirely satisfy your needs. If your primary concern is hair styling, then look for something more sophisticated regarding technical performance. It surely has to be a hooded hair dryer with several options for temperature and speed to let you achieve a desirable hairdo. For those who want to get perfect curlies, the size of a hood really matters. Some hooded blow dryers offer you special features like nano and ionic technologies for preserving your hair healthy and even treating it. Such a variant is obviously the most costly. You have to admit that the more features you want to get from your hair dryer, the more money you have to spend on it. Determine the budget for the buying. Are you ready to spend a few hundreds of dollars for an immaculate professional blow dryer? If your answer is ‘yes’, then you are a lucky one and simply have no limitations in the process of selection. So you can choose any of the items that suit your criteria. Otherwise, you need to take a closer look at the budgetary variants. They are not bad at all, just having some limitations – each in a different aspect. You only need to decide which of the features are obligatory for you and make a decision depending on it. Pay attention to specific characteristics like weight, height, cords length, an opportunity of adjusting the device, and so on. They may seem not important at first glance. But such seemingly small things can greatly affect your user experience. If you are tall enough, you will feel yourself uncomfortable under the hood that literally digs into your head. Do you travel often and need to look stunningly 24/7 in your journeys? Then check out for the models with a portable design. Such details need to be considered before you decide on a buying. Take the hair type into account. If you buy a hooded hair dryer for your own use, then consider your hair type and condition. If you have thick or curly hair (or both these types combined), then, first of all, you need to pay attention to the power of the appliance. It needs to be powerful enough to heat up and dry your locks. For those who have thin hair, the delicate regimes with a low temperature are more suitable. The more dense and long hair you have, the longer it dries. So choose between devices with a fast speed of drying. Of course, you can’t take into account each hair type of all the possible clients if you are a salon owner. Just make sure the selected hooded hair dryer will be universal and will suit the needs of all hair types. Think of all these extra features like timer, temperature regime sensor, ionic technology, nano antibacterial option, and so on. Are you sure you need them? If you are not, then do not overpay for them and set the limit on the required functions before you buy the dryer. And now you are totally equipped with all the information about hooded blow dryers. Sure, you can pick the best for your needs in the dark of night, with eyes closed, just by touch. Hope, you will make a perfect selection and finally find out what is healthy hair drying, safe styling, and home-spa hair treatment. Have you already get a splendid hairstyle with one of these hooded hair dryers? Or maybe you’ve found another one which makes your hair look adorable? Please share your thoughts about hooded blow dryers and their effects on your hair in comments. Let’s look together for the best options for drying, styling, and having our hair beautiful and healthy! Oh, I just love sitting under the hooded hair dryer when I visit my hair salon – my hair becomes so silky and soft after it. The prices are not too high and I think I gonna buy one. I’ll be grateful if you tell how to use a hood hair dryer properly. Hello, Monica! I like that using such a tool can let me dry my hair right after dying it – it’s very convenient and will definitely come in handy. But how long does it take to dry hair under a hooded dryer? Will I have to spend a lot of time with this thing on my head? Hood dryer is a good way to relax a bit. Don’t use it when you are in a hurry. It might take about 20 minutes for short hair to get hair dry with it.